The Amberola line - phonographs without external horn - was introduced by Edison in 1909. A number of rather similarly looking models (mainly differing in the design of the grill) were made before cylinder record production ceased in 1929. The Amberola 30 was introduced in 1915, and only played blue cylinder records. Cut a 4 mm (5/32") slice of 6 mm (1/4") square basswood for box. You might want to cut a 7 mm (9/32") square piece of thin wood for a base for the box. The lid will be glued together from three pieces, for a look of mitered molding. If you don't have paperwood or similar, take a piece of thin wood at least 6 mm (1/4") wide and sand down to about 0.5 mm (1/64"). Cut bottom and top pieces from the thin wood - one 6 mm (1/4") square and one 4 mm (5/32") square. Cut centre piece 5 mm (7/32") square from 1.5 mm (1/16") thick wood, and sand all four top edges round. If you did cut a base for the box, glue it in place, centered under the box. Glue thick lid piece centered onto thin 6 mm (1/4") square piece, the side with rounded edges should be up! Glue smallest piece centered on top of lid. Glue lid to box. Apply clear finish to phonograph and let it dry. Paint five or more vertical strips on front of box, using flat paint. Let dry. Poke a hole with a pin in the right side of the box, close to the lid and centered back/front. Bend wire at a right angle, about 2.5 mm (3/32") from one end. Make another bend 2.5 mm (3/32") away. Glue end into hole. Trim wire 1.5 mm (1/16") from 2nd bend. Apply a blob of black or brown paint to handle and let it dry. For cylinders, cut some 2.5 mm (3/32") pieces from rod or dowel. Paint them blue with white top and white text, and scatter them around your phonograph. 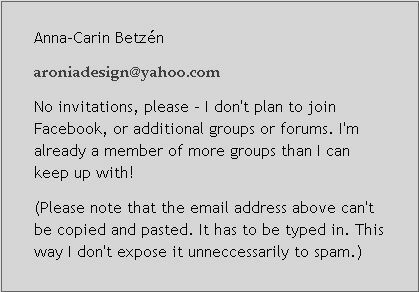 © Copyright Anna-Carin Betzén 2002, 2004. You're welcome to print the instructions or link to them, but do not copy them to repost elsewhere. This is a free project, not to be taught for profit. www.btz.se/minis/ web site by Anna-Carin Betzén. All rights reserved.